Scarce early map of Santa Barbara and Los Angeles California. (J No. 4) Preliminary Survey of San Pedro Anchorage and Vicinity of Santa Barbara California. 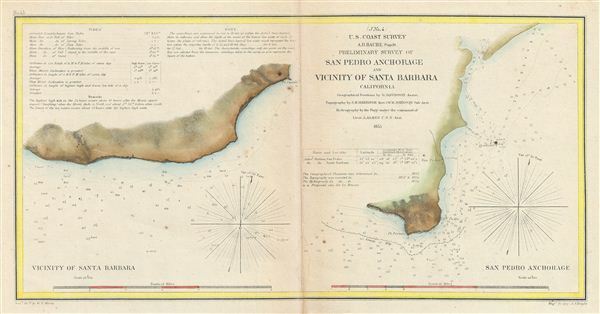 An uncommon example of the 1859 U.S. Coast Survey nautical chart or maritime map of Santa Barbara and San Pedro (Los Angeles), California. essentially two maps on a single sheet, the left hand map details the stretch of land that would eventually evolve into the city of Santa Barbara. When the Coast Survey issued this map Santa Barbara was, for all intent and purposes, uninhabited. The right hand map focuses on Point Fermin and the San Pedro Anchorage. When this map was issued the mission and landing at San Pedro had been established, as had the Los Angeles Mission further north. Today the modern city of Los Angeles incorporates this entire area. As a nautical map it further includes countless depth soundings (in feet) and a wealth of practical information for the mariner. The triangulation for this map was completed by G. Davidson. The topography is the word of A. M. Harrison and W. M Johnson. The hydrography was accomplished by a team under the command of J. Alden. The whole was compiled under the direction of A. D. Bache, one of the U.S. Coast Survey's most influential and prolific superintendents, for issue in the 1855 annual report to Congress. Bache, A. D., Report of the Superintendent of the United States Coast Survey, (Washington) 1855.